The "Uspishna Kraina" call on the global community to assess the attacks on entrepreneurs in Nikolayev ⋆ News ⋆ Official website for Oleksandr Klymenko. 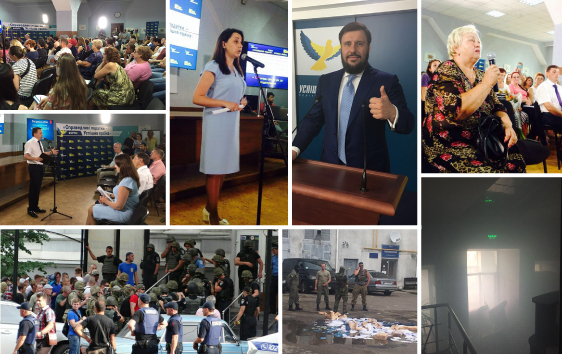 Radical criminal group again attempted to disrupt the forum of entrepreneurs, which is carried out by the “Uspіshna Kraina” party throughout Ukraine, in order to develop a fair Tax Code. On June 30, in the end of the forum, which was attended by 200 entrepreneurs from both the city and province, group of persons unknown in camouflage and helmets with bats, smoke grenades and cold arms broke into the building, where the event was taking place. All participants were evacuated. Police arrived on the scene just 1 hour after the beginning of the attack. Oleksandr Klymenko, the leader of the “Uspishna Kraina” party, wrote on his Facebook page: “While we were discussing, how to reduce the taxed, how to create work places, how to reduce the tariffs, aggressive thugs were hiding their faces behind the masks and tried to disrupt the Forum of Entrepreneurs in Nikolayev. The law enforcement agencies did nothing”. According to the politician, «tech. of the execution» “of this play is similar: law enforcement officers provide members of organized crime groups in masks with half an hour to do their dirty business, and then they allegedly begin to put things into order. Klymenko emphasizes that after the forum in Sumy application for the ensuring the security and order was submitted to law enforcement agencies early in the morning. Entrepreneurs, who attended the Forum, were shocked. During the attack, not only participants, but also journalists were threatened. By today, there is an information about one participant, who was hospitalized. “We understand that the authorities are afraid of us. They make a war against their citizens. Against peaceful entrepreneurs, who gathered to discuss taxes. In contrast to the government, we believe that people have always been our priority. We ensure the safety of people and evacuated all participants of the forum from the building, including the journalists, who were remaining hostages of the lawlessness of these thugs”, – Klymenko stated. The leader of the «Uspishna Kraina» party again appealed to Yuriy Lutsenko, the Prosecutor General, with the demand to ensure the order. The politician believes that not only «the members of the organized criminal groups», who attacks ordinary entrepreneurs, but also law enforcement agencies, which cover it, should be punished. The “Uspishna Kraina” party intends to appeal to all the embassies and Ministries of foreign affairs of all states, all international institutions and human rights organizations. “Nowadays, democracy in Ukraine is dying under the batons and grenades of radicals. If we do not stop this chaos, we will not have the country tomorrow!” – Klymenko states. More details about events in Nikolayev are on the Facebook page of the “Uspishna Kraina” party. During the forum, which was attacked, entrepreneurs of the city and the region were discussing the offers on the reform of the Tax Code. 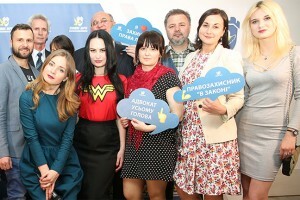 In particular, it was suggested to forbid any interference of tax authorities to the activities of entrepreneurs: “We demand a moratorium on inspections of newly created enterprises during three years, elimination of the tax police, as well as strengthening the responsibility of tax officials for abuse of power”, – Klymenko supported entrepreneurs. Let us remind, the “Uspіshna Kraina” party reported about pressure from the pro-government forces and radical organizations in Nikolayev. On June 18, party activists were threatened by representatives of Block of Petro Poroshenko in Nikolayev region, tents of volunteers were attacked by people with “Azov” stripes. Oleksandr Klymenko, the leader of the party, stated that actions of radicals are covered by oligarchs and power. A new Tax Code, which Is being worked out during the forums of entrepreneurs, introduces a luxury tax and prohibition of withdrawal of assets to offshores. According to the politician, current ruling elite is not satisfied with such provisions, meanwhile President Poroshenko is taking revenge for disclosure of fraud by Roshen in 2012-2013.